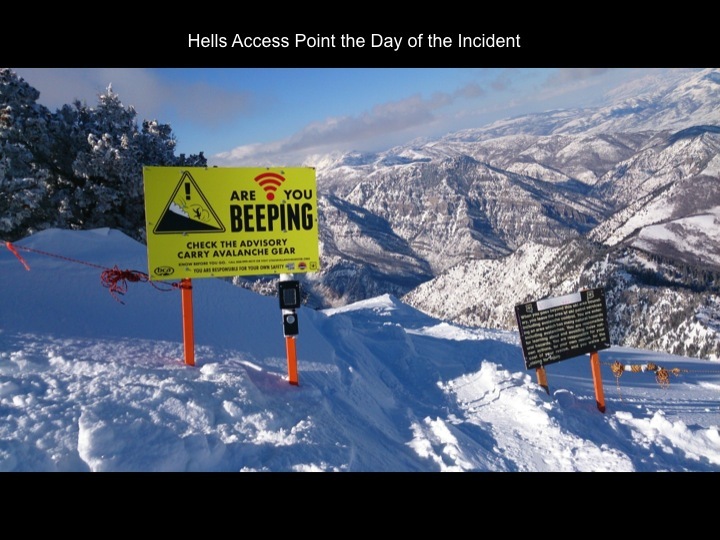 This excellent and complete accident report was written by Frank Waikirt and GR Fletcher, Snowbasin Ski Patrol. The winter of 2014-15 up to early March was record setting for both warmth and lack of snow. In 35 seasons of consistent record keeping at Snowbasin ski resort March 1st 2015 was the record lowest in both annual snow and settled snow. The last few days in February and early March there were some small storms adding up to about 4-6”. On the morning of March 3rd the area reported 15 inches of new snow. 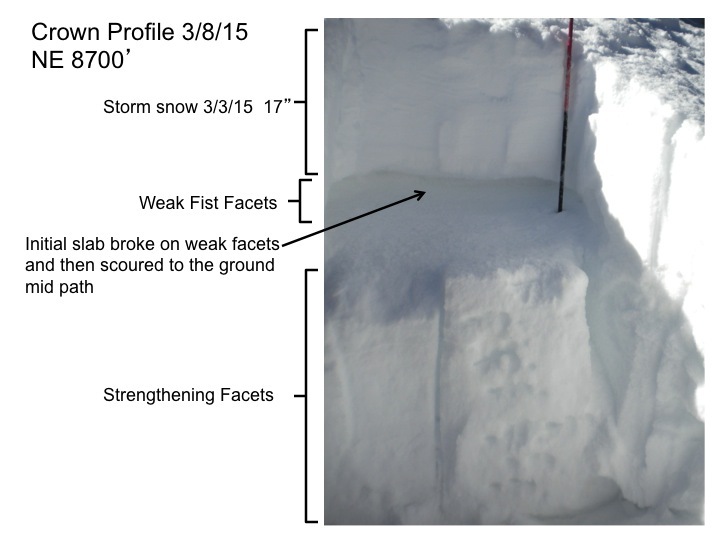 Reduction work that morning resulted in widespread class 2/3 avalanche activity both with ski cuts and explosives. 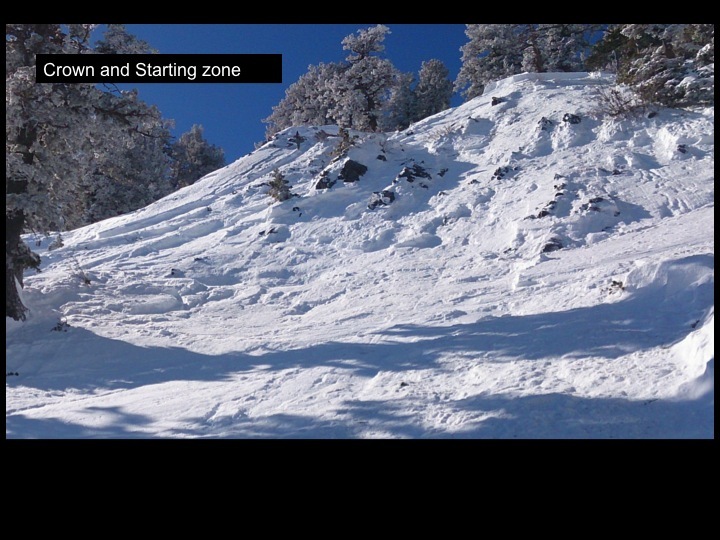 Much of the resort terrain stayed closed that day. The next day more reduction work was done with the goal of opening the rest of the resort terrain. Reduction work in the morning resulted in another round of class 2/3 avalanches. At 9:19 AM the No Name area was opened. There was a long line at the bottom of the tram and guests were anxious to finally ski some powder after a long dry winter. Colby Oldroyd and Blake Ford long time friends from Morgan Utah took the day off work to snowboard at the resort. Blake was a former employee at the resort and a season pass holder for nine seasons. Colby had been a previous pass holder in the Park City area for two seasons, and this was his first season pass at Snowbasin. They took their first run down John Paul and the next lap rode the Mt. Allen Tram to access the No Name terrain. The two of them travelled across the top of No Name and entered the Hells Canyon area. Blake had limited familiarity with the terrain, and Colby had only been there one time before. They traversed into the area about 50 yards when Colby felt that the terrain was too dangerous and they should get back to the ski area. They were traversing back to the ski area boundary when Blake who was out ahead was caught in the avalanche. Colby witnessed the slide and followed the path down yelling for his friend. On the way down he found a glove and the goggles of his friend. 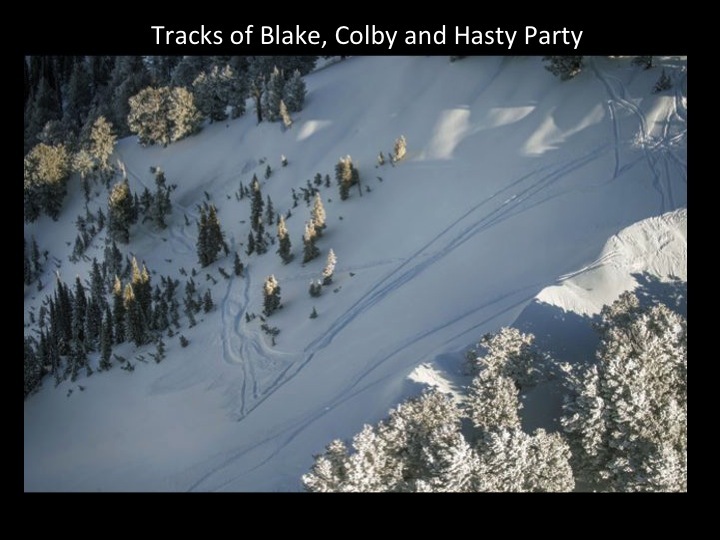 When he did not find Blake he attempted to call him by phone, when that failed he contacted Snowbasin Ski Patrol. 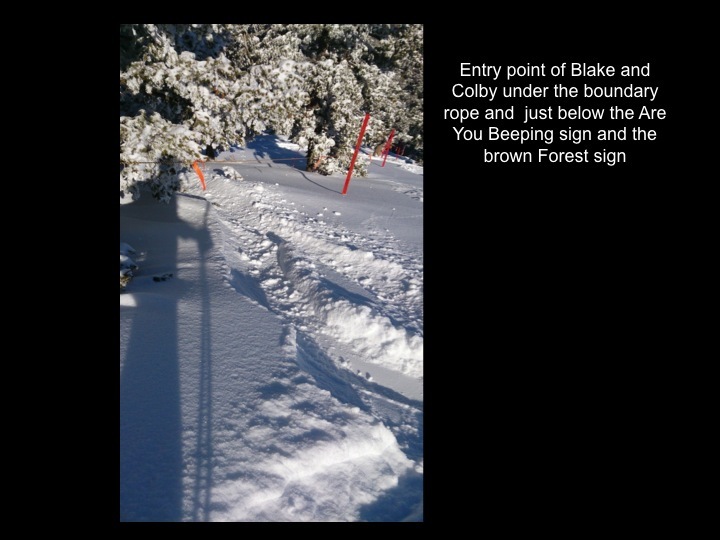 In a brief interview with Colby it was determined that Blake was the only one known to be in the area, and he was not wearing an avalanche beacon. Colby travelled back to the resort and was met by Ski Patroller Zaun Barnes who escorted Colby back to the top of Hells Canyon. At this same time ski patroller Corey Kruse was making an observation tour of the boundary to check for any traffic into the area. As he was standing at the boundary he heard voices of individuals in the terrain. He then heard screams of someone caught in an avalanche and also saw in the distance snow traveling down the mountain, soon after that he heard another person yelling and searching. At this point Corey informed Ski Patrol dispatch of the event. Life Flight was called to fly the scene and plans made to form a rescue party. G.R Fletcher was riding in Mt. Allen Tram when the call came in. He proceeded to No Name gate one and closed the gate. Also at this time a rescue party was being organized at the top of John Paul and explosives were being assembled. All other gates into the No Name terrain were being closed. Eventually a rescue party consisting of Snowbasin ski patrollers G.R Fletcher, Peter Francis with rescue dog Molly, Jared Bradley with hasty party flags and a RECCO, Jeff Whiting, Joe Marchione, Tommy Keating with explosives, Mike Erickson with explosives, and Jason Neumann all met at the top of No Name near the access point to Hells Canyon. Hells Canyon is a steep area with multiple paths that all converge in a single gully at the bottom. The Blake Ford avalanche only released a small amount of the potential snow in the start zones. At the top of Hells Canyon it was observed that there were four tracks into the area. Two went down a generally safe ridge to the north and two went toward the slide path in question. 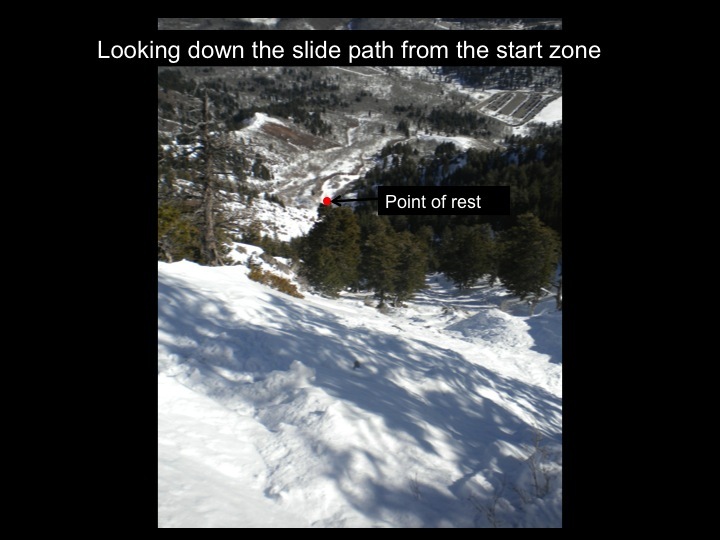 After Life Flight confirmed the slide path and that no one was observed in the path or in the terrain. A group discussion was conducted concerning potential hazards, search urgency and potential safe routes into the scene. 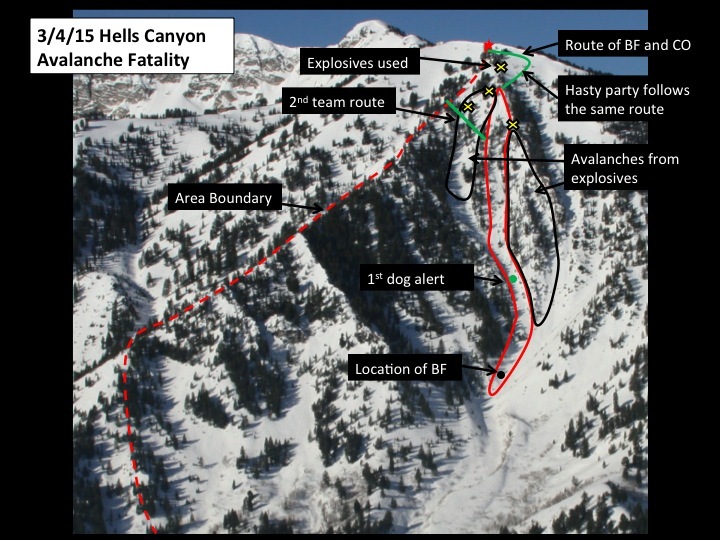 Eventually it was decided that a small group consisting of Mike Erickson with the explosives as Hasty Party leader, Peter Francis and Molly the dog, and Jared Bradley with the RECCO, would travel safely and carefully to the avalanche path using explosives as necessary. Once on the path they would follow that down to the debris pile. The rest of the group would wait for confirmation of a safe route to the site. 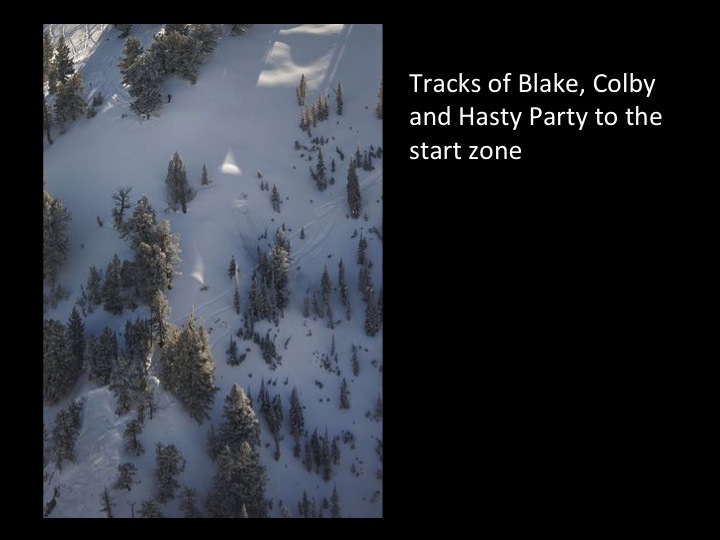 The hasty party followed the tracks to the start zone. 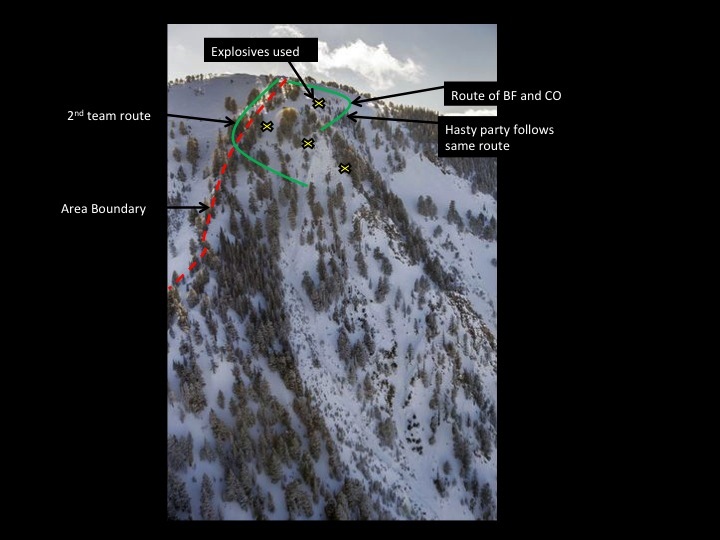 In order to remove potential hazards on both sides of the avalanche path explosives were thrown. 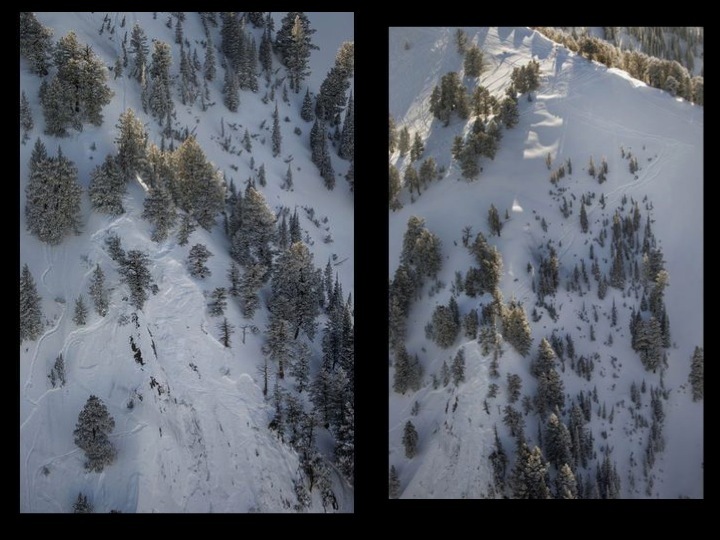 These released avalanches just as large as the original avalanche and both funneled into the same gully. After arrival on the scene Erickson requested more help, and the second party began their descent into the scene. By this time the second party was joined by Corey Kruse, Zaun Barnes and the witness Colby Oldroyd. 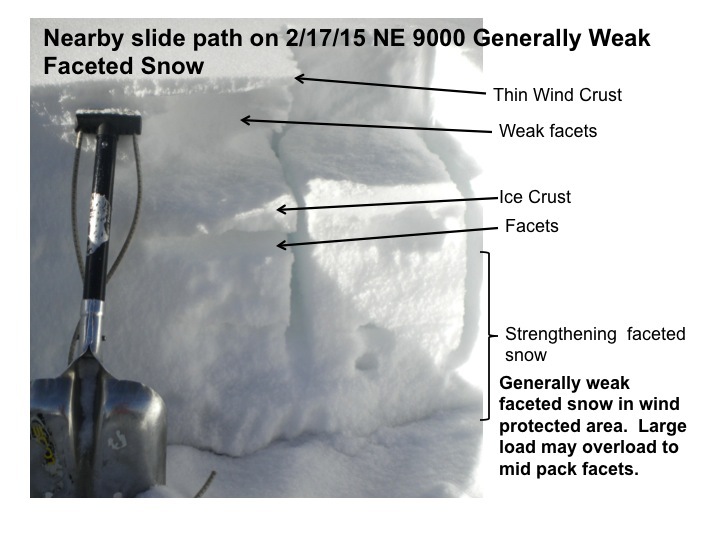 This group used the explosive protected slide path to the right to access the primary path and then descend to the scene. Once on the debris Molly was put into an active search. She had a strong alert 75 yards into the deposition pile. Erickson and Bradley began probing the area. With the probing in progress Molly continued to search the rest of the debris pile. Molly alerted again about 20 yards from the toe of the debris. Francis probed the area and had a positive strike on his second probe. When the victim was extricated at 1140 it was determined that he had injuries incompatible with life. At this point hoist extrication by Life flight was requested. After Blake was hoisted to the base area, the rescue party traveled together to the staging area and the incident was terminated at 1246. Thanks to KSL News for the aerial photos.